Looking for fun birthday party places St. Louis? Abra-Kid-Abra is a fun and unique party place for kids birthdays. What are two of the most popular entertainments for kids parties? Magic and bounce houses. Abra-Kid-Abra combines these to make a REALLY FUN kids party. As you’ll see in the client comments below, in our yelp reviews, and in this 2 minute video, we think this makes for one of the best kids birthday party places in St. Louis! Birthday Party Places St. Louis–Why Choose Abra-Kid-Abra? Jumping and magic give you physical fun and a fun show! 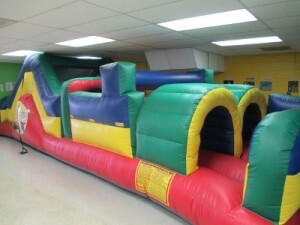 Our bounce house and obstacle course provide great, active fun. After 30 minutes of play, the kids are tired and welcome sitting down to enjoy a show. The show is more intimate. The performer interacts with the kids, providing a personal touch. Your child is the star. The kids laugh a lot and participate in the show. The inflatables and the magic make a great, complimentary pairing. You have the whole area to yourself. No other guests screaming or jostling to contend with. You are our focus while you are with us. You don’t have to run around putting goodie bags together. We provide the goodie bags, animal balloons made before their eyes, and a giant wand magic set as a special birthday gift for your child. 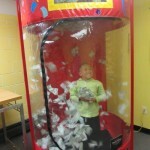 Our money machine provides an exciting finale for your party. Cheered on by friends, your child has 30 seconds to grab as many swirling play bills as they can, as they vie for their special birthday prize. We provide downloadable invitations for you. Fill in the details once, instead of having to laboriously hand write them on each invitation. 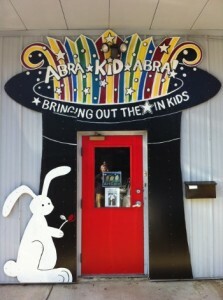 When it comes to birthday party places St. Louis, Abra-Kid-Abra is a great choice for your party! Choose from 4 different birthday parties at Abra-Kid-Abra’s St. Louis Party Place! 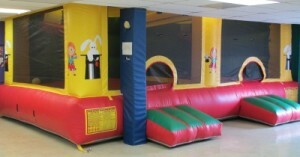 All include our bounce house, inflated obstacle course, and whirlwind of fortunes prizes machine! Kids love magic! 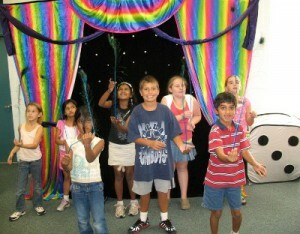 Your child will star and your guests will laugh in our comedy magic show. The magic show is highly interactive, so be prepared for the kids to be screaming with delight! After the show the kids are excited about magic. So we’ll teach them a few tricks they take home to amaze their friends and family! The take-home tricks make great party favors. 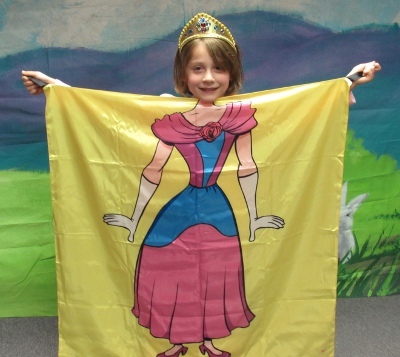 Is your daughter looking for a princess party location? We can provide a magic show where she becomes a magic princess, making magical things happen with a wave of her wand. The kids take home princess-themed favors, and learn tricks they can perform with their princess wand in our princess party. Experience the fun of a circus birthday party! The kids assist our ringmaster in putting on an interactive circus–complete with balancing acts, rings, spinning plates, and much more. Our circus party is highly interactive and very hands on, as the kids try their hand on several different pieces of juggling and circus apparatus. Your guests can take home a circus souvenir, and, if you like, we can even attempt the classic pulling the table cloth out from under the dishes! Our Hollywood make a movie party is popular with children from 8-13. 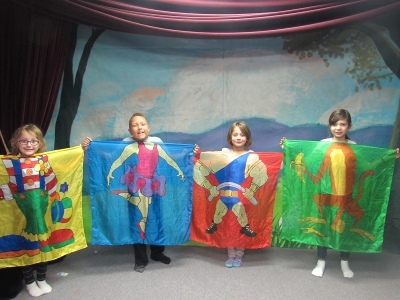 We teach the kids to perform magic, circus, and comedy acts. In the last 10-15 minutes of the party, the kids put on a show for their parents. The children star–especially the birthday child. We video tape the show for you and your family to enjoy for a long time! Birthday Party Venues St. Louis, Kids Party Places, Birthday Party Locations? It is amazing the different ways that people refer to birthday party places St. Louis. Some call them “birthday party locations”. Others say “kids party places”. Still others use “birthday party venues St. Louis”. Or how about “indoor party places”? However you refer to it, we look forward to making your birthday party a fun and special experience! Our birthday party venue is in St. Louis – in the Webster Groves area. We are at 803 Lafayette Avenue, off Brentwood Blvd., .4 mile south of Manchester. Centrally located, we are 1.5 miles south of highway 40, and 1.5 miles north of I-44. When we opened our St. Louis birthday party location in 2012, we thought that most of our customers would live nearby in Kirkwood or University City, or maybe Clayton. We have been pleasantly surprised that many of our clients come from 30 minutes away, 60 minutes away, or even farther! We routinely have people from St. Charles, Missouri. Many come from north or south county. We have quite a few from Illinois for their parties—O’Fallon, Belleville, etc. Our farthest ones so far came from Waterloo, IL and from Columbia, MO! Complete the info below. Or call 314-961-6912, or email us. Wes and his friends had a blast. Between the bounce houses and magic show, they were thoroughly entertained the entire time. Howie was fantastic. He was the perfect ring-leader for all the kids, with the perfect balance of patience and humor to keep them laughing and engaged. We were extremely impressed with the setup and accommodations. Our goal was to make sure everyone had fun, and you guys came through big time. We'll definitely be recommending you. Mae's party was great! The children just loved it! I really appreciated Bradley's passion for what he does. You can tell he takes much pride in making the party special for the children. I will definitely recommend Abra Kid Abra to friends and family!! The kids had a blast! I would rate the party a 10. 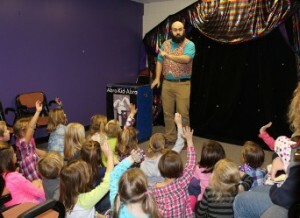 The magician was great and kept the kids engaged. When our other child is older, we'll likely have another party there. We had a great party. The kids really enjoyed themselves and from a parent’s perspective it was easy to plan and smooth on the day of. You providing the paper goods for cake and the goodie bags was a huge timesaver for me and made things completely hassle free. We were extremely happy with our experience at Abra-Kid-Abra. From the moment we arrived at this location we were treated very special in all aspects. This was a birthday party for my 5 year old granddaughter, who is extremely shy when put in a situation in front of people. Your magician was a self esteem builder for my granddaughter--including her and making her day one she (and all of us) will never forget! All the children and parents were thrilled and had a terrific time. The party was a total success. The kids had a great time and Ella really enjoyed being the star of the show. Howie was awesome. Got lots of compliments from the parents too : ) The T-shirt was a nice unique touch as well. THANK YOU AGAIN!